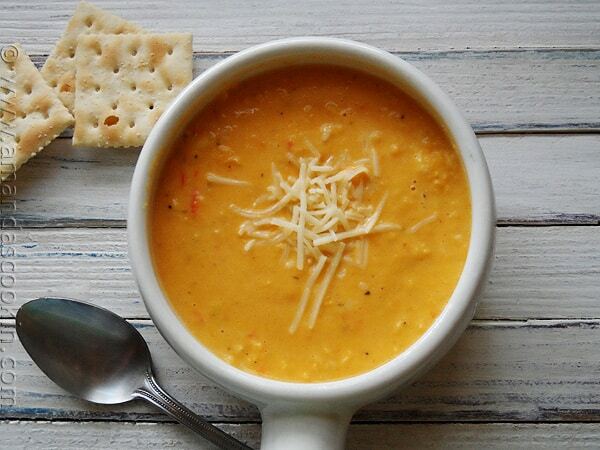 Golden kernels of sweet corn and sauteed red bell pepper paired with Vidalia onion lend a hand in making this beautiful, bright colored soup that’s perfect for fall. You control its texture, making it creamy or leaving in some chunks, then topping it off with gooey, melty cheese! Just look at that color! Tiny bits of red bell pepper peek through the gorgeous bright yellow corn filled broth. It’s warm and sweet, but if you prefer a bit more savory, simply season with some salt and pepper and you’ll have the best of both worlds! 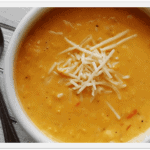 I originally found this wonderful white cheddar soup recipe on Sargento’s website. Luck would have it that I just happened to have purchased bag of their white cheddar cheese so the timing couldn’t have been better. I used an immersion blender and left this soup a but chunky, but if you prefer a truly creamy texture, the food processor is your best friend here. I cut my recipe in half and increased the red pepper, the perfect amount for a few days worth of lunches. 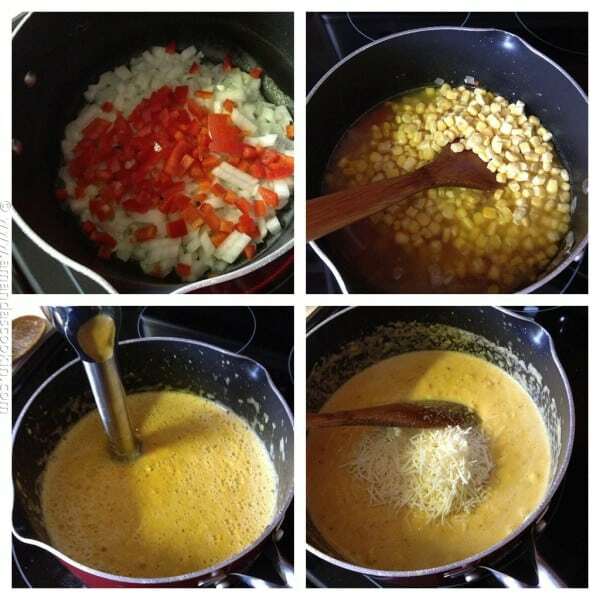 After sauteing sweet onions, red bell pepper and garlic you will add in the broth, corn and seasonings. Let it simmer for about 30 minutes then blend. 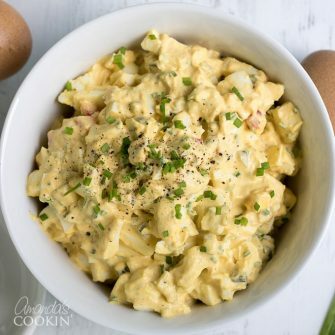 Afterward you’ll add the cream and cheese then serve with your favorite garnishes! 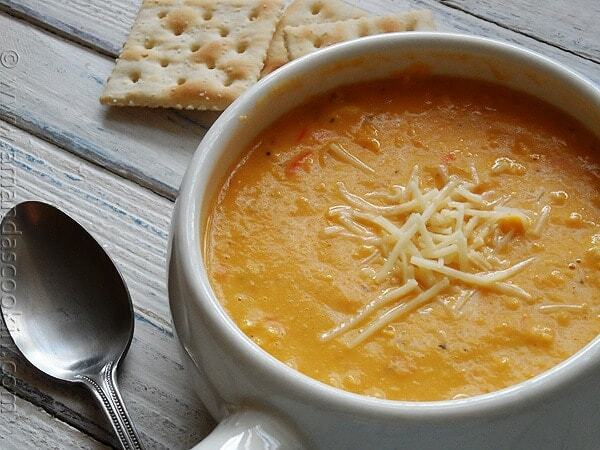 A perfectly wonderful autumn soup for the chilly days ahead! Melt butter in a large saucepan over medium heat. Add onion and bell pepper; sauté 10 minutes. Add garlic; sauté 2 minutes. Add broth, corn, bay leaf, salt, pepper and thyme leaves. Bring to a boil over high heat. Reduce heat; simmer uncovered 30 minutes. Discard bay leaf. Transfer mixture 2 cups at a time to a blender container. Remove round plastic disc from lid; close lid and cover opening with a thick kitchen towel or pot holder. Hold towel over lid while blending mixture on high speed until mixture is pureed. Transfer mixture to a saucepan. Repeat with remaining soup mixture. Add cream to soup; bring to a boil. Stir in cheese; turn off heat and stir until cheese is melted. Taste and adjust seasonings. Ladle soup into shallow bowls; garnish as desired. This looks and sounds amazing. Can’t wait to try it! Thank you so much for sharing the recipe and your beautiful photos. This corn chowder sounds great. Love the photos. The color is indeed fantastic! 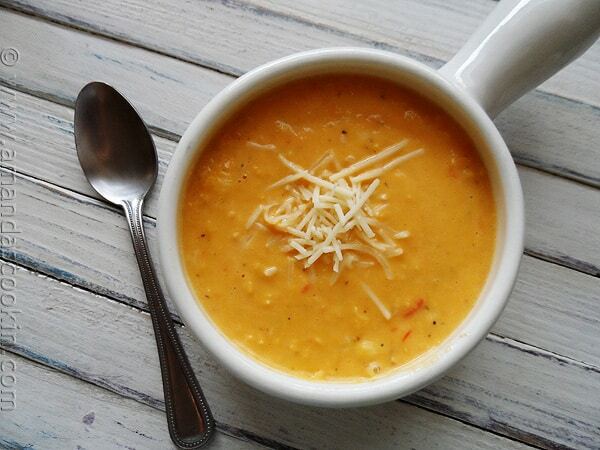 I don’t know why I never thought to pair corn and cheddar in a soup, but it sounds just divine. This would make a great contribution to this month’s Shine Supper Club (our theme is one-pot meals)–hope you’ll join us! Oh I am totally making this! Love that it only makes 4 servings too. Whenever I make soup I eat the leftovers for weeks haha. This looks and sounds delicious! 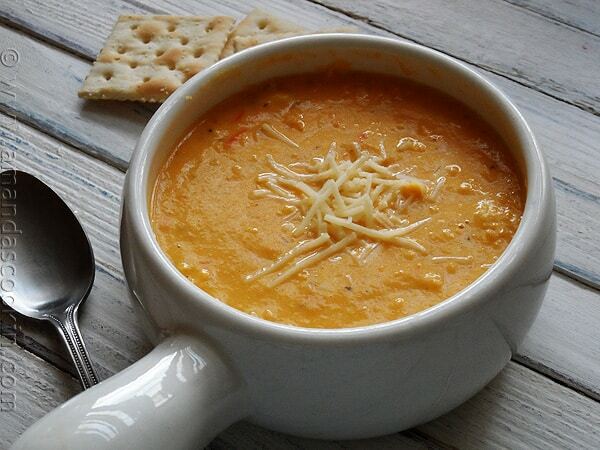 I love a creamy, cheesy soup!